Dr Pravin Togadia starts his Political journey with Hindusthan Nirman Dal (HND), to contest from all seats in UP and Gujarat for building Ayodhya Ram Temple and the interest of common Hindus. In another development after the announcement of HND, Gujarat Police with hooligans sneaked into the AHP office of Dr Pravin Togadia in Paldi area of Ahamedabad and ransacked the office and threw away the household goods and worshiping deities in the streets, as alleged by Dr Togadia in his twitter handle. 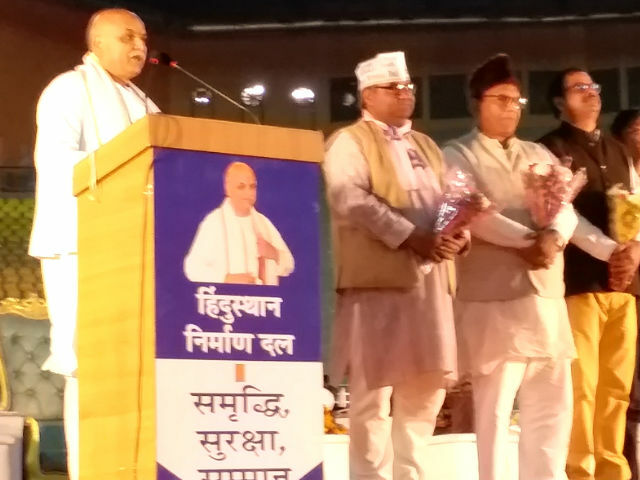 “Congressikaran (transformation into the Congress) of the BJP has happened — both in its ideology and by its people… There are Rita Bahugunas in BJP in every state…Congress men are MLAs and ministers in BJP governments in several states, including Uttarakhand, Assam and Uttar Pradesh,” Togadia said as he launched his party, referring to the BJP minister in the Uttar Pradesh government, Rita Bahugana Joshi, who was previously in the Congress. He also hit out at Prime Minister Narendra Modi and the BJP government at the Centre for “not keeping the promises they had made before the 2014 Lok Sabha elections”. “At present, BJP is in power — from panchayat to Parliament, but still Ram Temple was not been built in Ayodhya,” Togadia said, adding that if he would come to power, construction of Ram temple will begin in Ayodhya within a week. “Pakistan is taking our fishermen from Gujarat hostage, and our Prime Minister is sharing cake with Pakistan Prime Minister,” Togadia added. He also said that Army will be ordered to “bombard stone-pelters” in Kashmir to end stone-pelting and population control would be ensured by enforcing ban on more than two children. Togadia had been at loggerheads with the BJP, and after parting ways from the VHP he has been consistently criticising the VHP and Narendra Modi government on the issue of Ram temple. Togadia said that the BJP lost the Assembly elections in Madhya Pradesh, Rajasthan and Chhattisgarh because they “failed to fulfill the promises they had made”. He said that farmers were committing suicide and youths were not getting jobs. He said his party would “not divide votes of any political party but would emerge as an alternative to others”. Earlier, his supporters called for making Togadia as the next PM and hailed him as Modi’s “alternative”. __Inputs from Agencies, Indian Express and Suray Samachar. Brahm Mehrotra is the greatest chamcha of Narendra Modi— the Betrayer. Kick out the Hindu Betrayer Cong and BJP from the political arena. Dr Togadia is strong will personally in India.He will definitely succeed in his mission. This entry was posted on February 10, 2019 by hinduexistence in Demand for Cow Protection, Demand for Hindu Agenda, Demand For Hindu Rashtra, Demand for Ram Temple at Ayodhya, Demand of Uniform Civil Code, Goraksha, Hindu Advocacy, Hindu Agenda, Hindu Agriculture, Hindu Conference, Hindu Demand, Hindu Demand for Ayodhya Ram Temple, Hindu Demand to Ban Cow Slaughter, Hindu Demand to save Ganga, Hindu Inspiration, Hindu Leadership, Hindu Politics, Hindu Promises, Hindu Protest, Hindu Religious Issues, Hindu Solidarity, Hindu Unity, Hindu Victory, Hindu Vote Bank and tagged Division of Hindu Votes, ensure Practical Hindutva and need of public, Fulfill Hindu Demands, General Election 2019, Hindu Vote Bank of BJP, Hindusthan Nirman Dal (HND), Pravin Togadia declares his own party Hindusthan Nirman Dal, Togadia places 10 Hindu demands including Ram Temple, Urgent construction of Ram Temple.